During my time in South Africa, I visited several souvenir markets and shops, especially at the start on Long Street in Cape Town, and toward the end in the suburbs of Johannesburg. 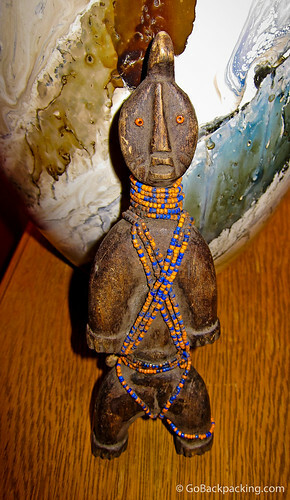 Wooden dolls from countries all around Africa were plentiful, so the casual shopper had only to decide which style he/she liked the most. That style would invariably be the hallmark of a particular culture and country. Go to enough markets, and see enough dolls, and you'll soon be able to discern which items come from which nation. The dolls vary in significance. One common purpose, such as the the one I purchased, is protection. Great travelling tips! Thanks for sharing. I really believe that travellers should take a lot into consideration when travelling, like travel insurance for instance. Nice, portable protection and cute souvenir for any traveller. Like the snippet story. I like buying souvenirs, but I never do it anymore, it adds on too much weight. But I always promise myself to return one day when I’ve settled down and buy all the things I never could before! Really Sofia? I can’t imagine not buying souvenirs. I’ve certainly changed my ways though. Now, I’d rather spend money on one or two cool things to bring (or ship) home versus a lot of cheap knick knacks.